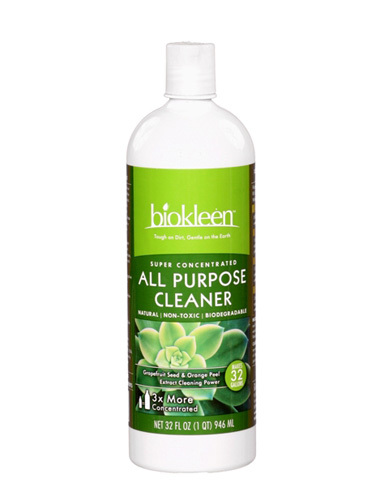 Just add Water and Clean: Our All Purpose Cleaner is super concentrated to cut through the toughest grease and dirt without the use of toxic chemicals. Safe for most types of surfaces, works in cold water, and leaves no harsh residues or fumes behind. One of the safest, most versatile cleaners on the market. Our neutral pH formula is gentle to all water safe surfaces, non-irritating, non-flammable, and non-corrosive. Cuts through tough dirt, grease, stains and odors without harsh or annoying fumes. For Floors, Kitchens, Bathrooms, Laundry, RV's, Boats, Walls and Water Safe Materials. - Environmentally friendly with no negative affects on rivers, stream, plants or wildlife. INGREDIENTS: Surfactants from Coconut and/or Corn, Grapefruit Seed and Pulp Extract, Orange Peel Extract, Linear Sulfonate, and Filtered Water.